You will often read that registration of births was not compulsory until 1874, so if you are looking for a birth before that date, and cannot find it, it may be because the birth was not registered. Well, yes and no. YES, the law was changed in 1874, but NO, it did not make a significant impact on the rate of registration. One of the numerous changes made to registration by the 1874 act was that the onus for registration was now placed on the parents, and not the registrar. Parents could be fined for failing to register a birth, but this was not new. 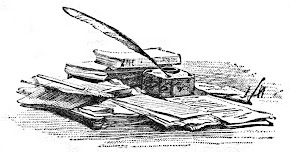 From the introduction of registration in 1837, parents could be prosecuted for refusing to supply details when asked by the registrar, or for refusing to sign the register. And they were. The Sheffield Mercury of 28 October 1837 reports the prosecution of John Wainwright for refusing to sign the register. His defence was that his child had been baptised in the Church of England, and that this was sufficient. In the early days, this was a common misconception, encouraged in some places by the clergy. It was universally recognised that the wording of the 1836 act was deeply flawed, and it was not until 1874 that many of the problems were addressed. Meanwhile, the Registrar General was rightly concerned that registration of births might be incomplete, and 'pour encourager les autres' there were a number of prosecutions. Handbills were made of the report of Wainwright's prosecution. These could be handed to anyone who showed reluctance to provide information, or to sign the register, and this seems to have been quite effective. There certainly were some deficiencies in birth registration in the early years, but the rate of non-compliance was much lower than some people would have you believe, and it was not uniform, either in place or time. As you'd expect, it took a little time for people to get the hang of this radical new system; the Superintendent Registrar of Birmingham, William Pare, estimated that in the first quarter of civil registration, July-September 1837, 340 births in his area went unregistered, against 677 that were registered, but in the second quarter only 118 were unregistered, and 905 registered. This is a massive improvement in a very short time. William Farr, who was Deputy Registrar General for many years and can be described as the first government statistician, estimated that the overall rate of non-registration was about 5% for the whole period 1837-1874, and that compliance improved over time. So the rate of non-registration would be much lower than 5% by 1874, and the change in the law would therefore make no appreciable difference. The table above is taken from the figures provided by the annual reports of the Registrar General. 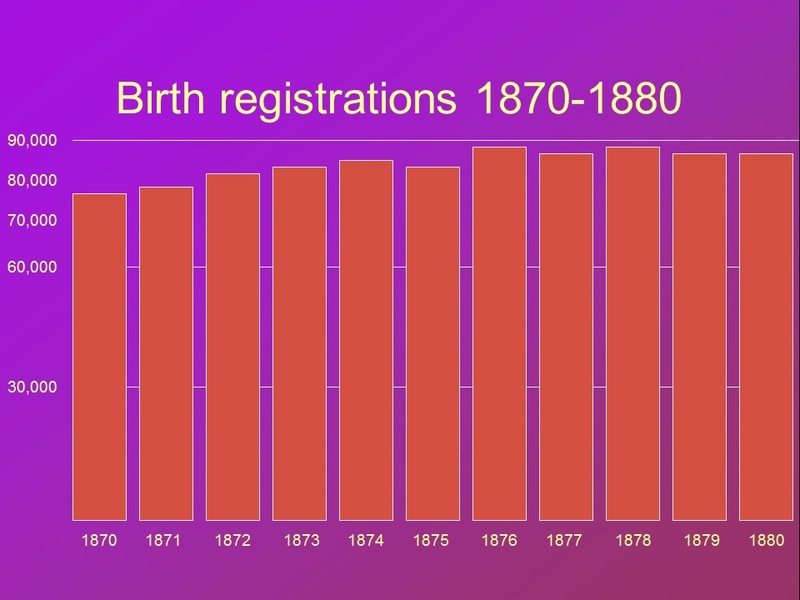 If the 1874 act had any impact on the rate of registration, you would expect a noticeable increase in births registered in 1875, the year it came into effect. In fact there was a small decrease although that isn't very significant either. 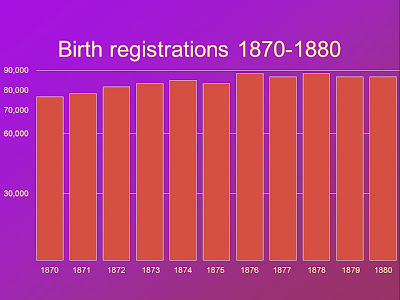 So if you fail to find a birth registration before 1875, it is possible that the birth was not registered, but it is more likely that the entry is either mis-indexed or omitted from the index through human error, or the name, date or place of birth are not what you had expected, for a variety of reasons. William Farr's conclusions can be found in a collection of his writings 'Vital Statistics' published in 1885. You can also find all of the Annual Reports of the Registrar General of England and Wales from 1836 to 1920 on the HISTPOP site, which also contains very informative essays on Civil Registration and the census. Countdown to Rootstech - two weeks to go.